Plays music at the touch of your finger. Features metallic accents, a real metal lantern, and artist Jim Shore's signature! Measures about 19 1/2-inches wide x 11 3/4-inches tall. 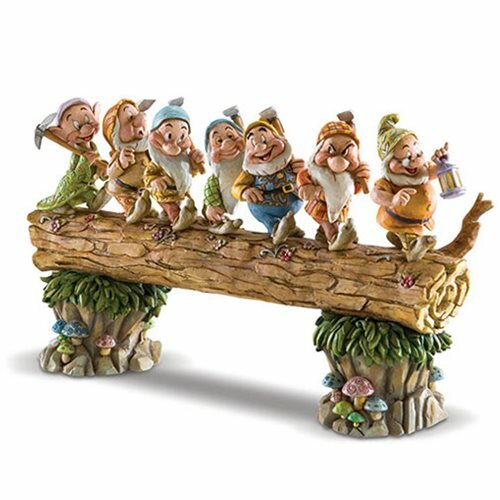 Measuring approximately 19 1/2-inches wide x 11 3/4-inches tall x 5 3/4-inches long, this extraordinary Disney Traditions Snow White and the Seven Dwarfs Log Masterpiece by Jim Shore Statue features music the plays 45 seconds of the tune "Heigh Ho!" Simply touch the base below the front of the log to activate. With beautiful metallic accents, a real metal lantern, and artist Jim Shore's signature on under-stamp, it's also made of polyresin, plastic, and calcium carbonate. Requires 3x "AAA" batteries.